Description of "Organisation and Ownership"
The book brings categorically that ownership is a multi-dimensional concept, not a unidimensional one. The study also brings out there are substantial differences in management of the companies in three different types of ownerships. The study also highlights reasons for intra-sector differences in management, which result in differences in performance (in different financial parameters). The wrong conceptualisation results in confused expectations in performance, rather than benefitting from sectoral differences by assigning different roles. The study opens up new challenges of research and management to harmonise their coexistence as balanced role can give economic growth in a way that can bring social justice and prosperity for all, preserving sovereignty of the country. 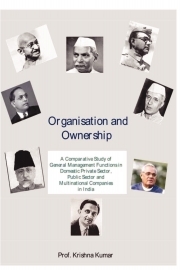 Reviews of "Organisation and Ownership"